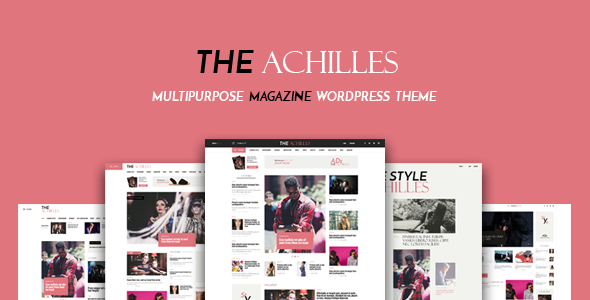 Achilles is a WordPress theme that lets you write articles and blog posts with ease. We offer great support and friendly help! Flexible Layout Options â€“ Create your professional website with 17+ Post Layout for Blog/Search Listing, 5+ Post Single Layout with creative animations. Each page, post, category and archive can be set to be as expressive and inique as you desire! Powerful Theme Option â€“ Theme Options are perfectly positioned allowing you access them effoertlessly. We believe that our themes should be so eassy to use that you no longer need the documentation. EMO Skin Options â€“ Create unlimited skins and apply easily in Theme Options that gives your website the professional look and feel you are truly looking for. 10 Custom Widgets â€“ EMO gives you the flexibility and ease of use to display your content the way you want it without altering any code with our custom widgets: Banner, Breaking News, Follower Us, Gallery, Login â€“ Register, Post, Post Tabs, Social Profile, Social Share, Twitter. Ad Optimized â€“ Add advertisement areas in prominent spots as your liking in a professionally looking online magazine. Sticky Sidebar â€“ Use Sticky sidebar feature to have a visible sidebar that moves automatically when scroll down page. Advanced Typography Options â€“ You can change the overall typography just with some click such as font family, font size, font weight&style.